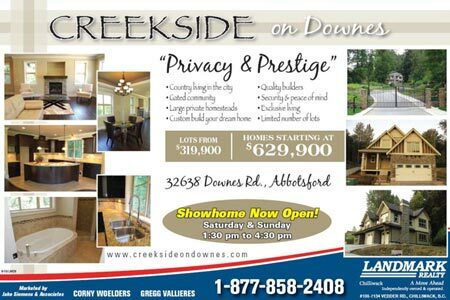 A new subdivision in the heart of Abbotsford real estate market is now available at the Creekside on Downes community. With privacy and prestige, these new estate lots and Abbotsford homes for sale are now available at affordable price so that you can customize and build your dream house right now! Fraser Valley offers country living appeal, and the new Abbotsford Creekside on Downes homes and lots for sale are one of the most talked about new subdivision communities in the area. The square footage of the highly customizable Abbotsford homes for sale range from 1650 to 4900 square feet in size, making them spacious enough for couples and growing families alike. Located in a quiet, country like setting, this gated community at the Creekside on Downes homes for sale include large private homesteads and country living that is not found anywhere else so close to the city. Built by quality builders with security and peace of mind for homebuyers, the exclusive living opportunities are selling out quickly, so if you are looking to build a dream Abbotsford home, the Creekside on Downes gated community should be at the top of your list. There are only a limited number of estate lots for sale that start from three hundred and nineteen thousand, nine hundred dollars ($319,900). If you want a builder to construct your dream Abbotsford home, you can purchase new houses from $629,900, making them extremely affordable for homebuyers. The Creekside on Downes Abbotsford homes are now previewing on site at 32638 Downes Road and they are open on both days over the weekend from 1:30pm to 4:30pm or you can book a private appointment with Corny or Gregg at any time by calling 1.877.858.2408. The great thing about Fraser Valley living is that you can have the country living lifestyle while being so close to major metropolisis and urban centres. Such is the case at the new Abbotsford Creekside on Downes real estate development that features scenic natural settings, quiet communities and a great capital investment opportunity over time. Not only is the population increasing very rapidly in Abbotsford BC, but it is also one of the fastest growing cities in all of Canada. Premier Pacific is now marketing the release of estates lots and custom built Abbotsford homes at Creekside on Downes Road which offers outstanding Fraser Valley living opportunities for families and couples wanting the quieter lifestyle and slower pace. Just seventy two kilometres from downtown Vancouver, Abbotsford real estate market has hit one of the many spikes in capital appreciation over the past decade, and with prices still going up, there is no doubt that this fast growing city will continue on its upward trajectory when it comes to both population growth and home appreciation. Country living at the Premier Pacific Creekside on Downes Abbotsford homes for sale (in addition to large homesites/lots) features an upscale gated community with fine estate sized houses. Large private homesteads are custom built to an exceptional level of finishing and quality. Homebuyers will enjoy an outstanding location with easy access to central downtown Abbotsford. The Creekside on Downes Abbotsford homes start from only the low $600s, and there are many bonuses and optional upgrades included with this price for a limited time. The show home is open Saturday and Sunday afternoons. Visit creeksideondownes.com for more information.